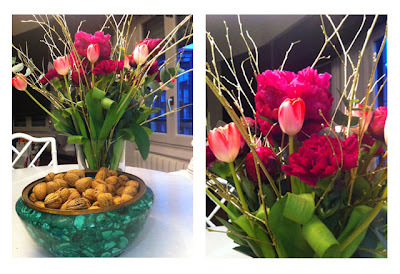 This weekend we made a stroll to the flower market and got some fuchsia/ruby red peonies, tulips, and gold branches. These gold branches I absolutely love and are an easy DIY to make. With my baby 24 on my arm it was impossible to spray paint these myself and bought them this time. I am very fond of my antique malachite planter that is been filled to the brim with walnuts. Our Christmas tree is up. A vintage DIY spray painted bird that I had from last year I used to top the tree. 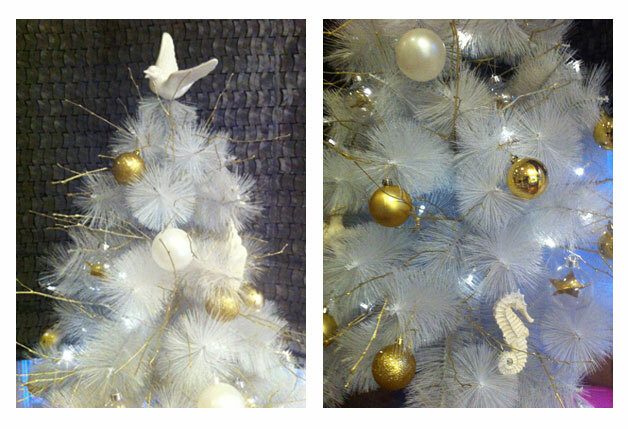 I chose this white tree as I wanted something diferent. To soften it up I used some gold branches and stuck them in between the white plastic branches of the tree and gold and white christmas balls. Maybe I add something more, maybe not. 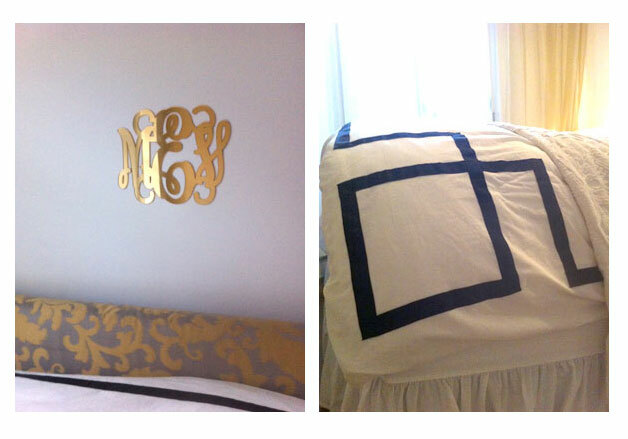 I am in the gold phase, as you can see things added to the decor are mostly golds...I am thrilled with this gold mirrored monogram I bought over Me and belle. Me and belle is an online boutique that makes custom monogram keychains, wall appliqués, silhouettes and more...so recommendable to pay the shop a visit. I stuck it to the wall above our bedboard. Before we had a Vintage sunburst mirror there but with our baby playing on our bed I had nightmares about that thing falling down, off it went and now finally the wall doesn´t look so empty any more. Another great change is that I had black ribbon sewed on to a simple white duvet cover from Ikea and now it looks so much more interesting. It has this square design in all 4 corners of the cover.